Relevance CRT0036521 is a highly potent and selective inhibitor of the Type 5 17-β-Hydroxysteroid. A high-throughput screen identified 3-(3,4-dihydroisoquinolin-2(1H)-ylsulfonyl)benzoic acid as a novel, highly potent (low nM), and isoform-selective (1500-fold) inhibitor of aldo-keto reductase AKR1C3: a target of interest in both breast and prostate cancer. Crystal structure studies showed that the carboxylate group occupies the oxyanion hole in the enzyme, while the sulfonamide provides the correct twist to allow the dihydroisoquinoline to bind in an adjacent hydrophobic pocket. SAR studies around this lead showed that the positioning of the carboxylate was critical, although it could be substituted by acid isosteres and amides. Small substituents on the dihydroisoquinoline gave improvements in potency. A set of “reverse sulfonamides” showed a 12-fold preference for the R stereoisomer. On Target IC50 IC50 of 0.013 ± 0.003 μM for AKR1C3, compared with 20.3 ± 3.8 μM against AKR1C1 and >30 μM against AKR1C2 and AKR1C4. Selectivity Isoform-selective (1500-fold) inhibitor of aldo-keto reductase AKR1C3. Does not display any COX (cyclooxygenase) inhibition at 10 µM in whole blood assay. In vitro applications The compounds showed good cellular potency, as measured by inhibition of AKR1C3 metabolism of a known dinitrobenzamide substrate, with a broad rank order between enzymic and cellular activity, but amide analogues were more effective than predicted by the cellular assay. displays potency in a cellular assay, blocking the ability of AKR1C3 to metabolize a proven substrate. Jamieson et al. 2012. J Med Chem. 55(17):7746-58. PMID: 22877157. 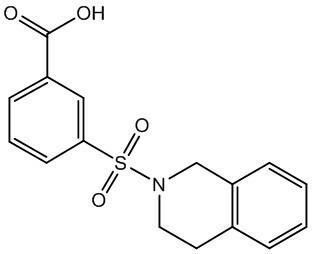 3-(3,4-Dihydroisoquinolin-2(1H)-ylsulfonyl)benzoic Acids: highly potent and selective inhibitors of the type 5 17-β-hydroxysteroid dehydrogenase AKR1C3.